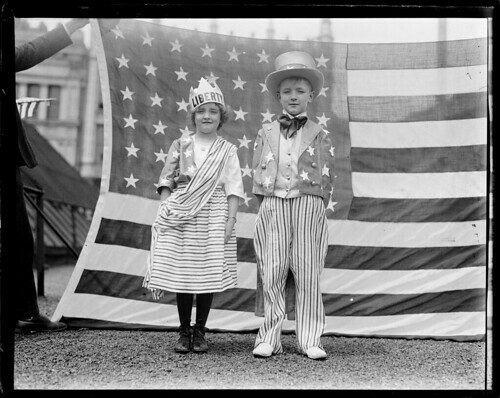 Kiddies dressed as “Columbia” and “Uncle Sam”, Bunker Hill Day, Charlestown, a photo by Boston Public Library on Flickr. This photo is from Bunker Hill Day, 17 June, in the year 1917. The United States went to war in Europe on 6 April of that year. Columbia and Uncle Sam made many appearances during the Great War, particularly in recruiting posters. Alas, when folk look at these posters today, they know who Uncle Sam is, but who’s that lady wearing the liberty cap? America By Another Name‘s goal is to correct this state of affairs.